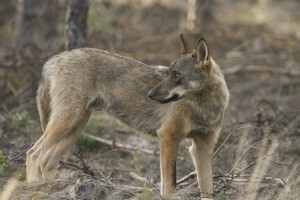 Is the economic “crisis” in Spain helping the Iberian wolf? 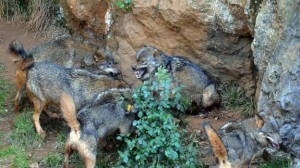 An interesting article in the Guardian about the Iberian Wolf states that Spain is now a wolf stronghold and there are thought to be more than 250 breeding groups totaling more than 2,000 individuals. But, is the Spanish economic “crisis” really the reason for population increase or is it because of better education, local awareness and more land under the protective arm of natural and national parks? I’ve just come across the remarkable true story of Marcos Rodríguez Pantoja, a boy who spent 12 years as a boy living with wolves in the Sierra de Cardeña in the Sierra Morena. 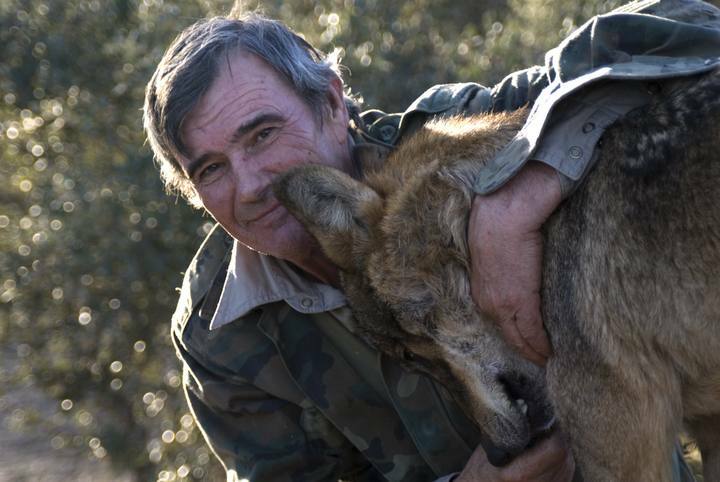 His story is now being told in a new film entitled Entre lobos to be released in October. Marcos Rodríguez Pantoja was born on the 7 May 1946, and remembers being taken away at the age of 7 by a man on a reddish horse. He believes he was sold or hired to tend goats, a not unusual arrangement for children of that age. It also wasn’t unusual for goatherds to live up on the mountains with their animals and only visit human habitation every few years. Marcos worked with an old goatherd for possibly several months before the man died, but in that time he’d learnt to fend for himself in the mountains, looking after the herd of goats and ensuring they bred successfully. He made friends with wolves, and lived variously in a cave, an old hut, and a hut that he built himself. –Yo estaba preparado con el cuchillo. La carne que yo no quería se la llevaba a los lobillos. Los padres no me dejaban, pero como veían que yo les llevaba de comer, cogieron confianza. Yo olía como ellos. Cuando yo quería que vinieran, cuando me veía que no tenía salida, empezaba a aullar. Venían varios lobos y, como se daban cuenta de que estaba perdido, se tiraban a mí dando saltos y me cogían los brazos con la boca hasta que yo reía. Empezaban a jugar. Luego me señalaban el camino hasta la cueva de ellos y, desde allí, yo ya sabía irme. Me divertía yo solo con los animales. Y se entendía con ellos. Con sus mismos sonidos. En cuanto uno menos se lo espera, Marcos, hoy, coge una hoja del suelo y se la pone en la boca. Pij, pij, pij… El ruido que hace el águila. Y también imita el de la perdiz macho. Y el de la perdiz hembra. Marcos era uno más en la naturaleza. “Dormía con la zorra. La zorra era la primera que se metía debajo de mis piernas cuando había tormenta o llovía”. También vivió un tiempo con una camada de ratones, a los que daba leche de cabra. Y siempre planeaba por allí algún águila, a la que le troceaba los conejos o perdices que atrapaba. “Ponía la presa en un plato de aquellos de corcho y más contentos… Acariciaba a las águilas, las besaba, y se iban más contentas…”. Janer, el antropólogo, analiza estos pasajes: “Marcos no inventa, pero cubre con la imaginación su necesidad de saberse querido por alguien”. The first female wolf in 80 years has been detected in Catalonia in the Sierra de Cadí. 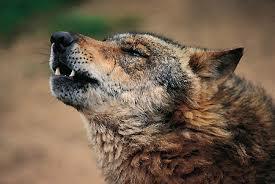 The first wolf in the Cadi was detected in 2004. More from Crónica Verde. There is a curious historical coincidence with Catalan wolves and Pablo Picasso. Horta de Sant Joan (where the last wolf was shot) was were Picasso is often considered to have developed cubism for the first time and he famously declared, “All I know is thanks to Horta de Sant Joan“. The great artist also spent some time in Gósol, the centre of the Cadí (where the new wolves have arrived), from the spring of 1906 to mid-August of that same year, where his works have been called his Gósol period. There are small Picasso museums in both villages which quite reasonably take advantage of his illustrious stays to promote themselves. March 8th, 2010	New one for Places in Spain. A shrine to a woman supposedly devoured by wolves on Mt Gorbea in the Basque Country.